This is a question that can be applied to any diving all over the world, why should I dive in Fiji or Australia or the Mesoamerican Reef in Mexico. 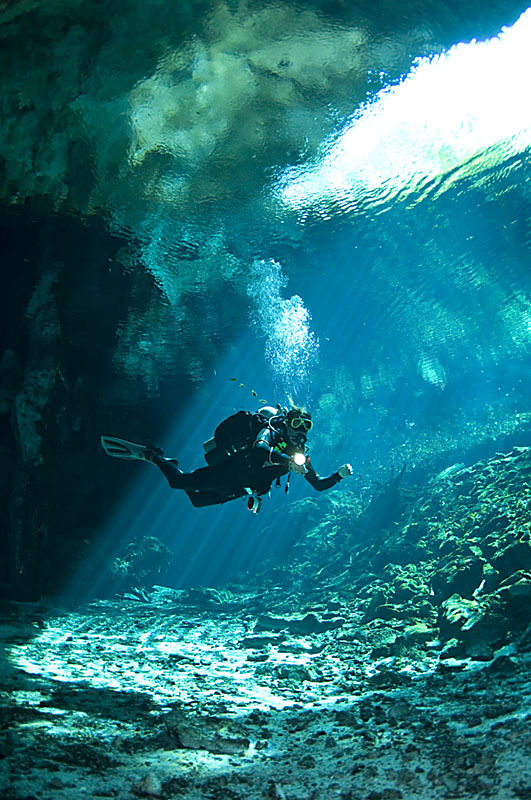 But when it comes to cave diving, we have to say the Yucatan Peninsula is the queen of cave diving trips! 1. Visibility. People only dream of our visibility in the fresh water system that we have here. it is clear, it is not silted, unless you silt it, it is the closest to space travel you will ever feel. Many other caves in the world have competing water systems that feed into the caves. Though we have that here, they seem to compliment the water, not hinder it. Check it out for yourself, it is incredible. 2. Haloclines. This is when fresh water meets salt water. Normally in a thermocline the colder water which is all fresh will sink to the bottom. In our systems, salt water is more dense than fresh so the salt water with the fresh water creates a halocline, a distinct differentiation between these two water densities. The fun part, salt water is warmer so you end up with an inverted warmth factor. If you are lucky and you are the first to enter the area where a halocline exists, you can witness where the two water densities meet, and the distinction is amazing. 3. Natural formations. Due to the geography of this area, we are fortunate if not blessed to have some of the most decorated systems in the world. The stalagmites and stalatites are intact, finite and in some areas extremely large. YOu wont be finding this anywhere else in the world and we are proud to have such a great display of natural cave systems. 4. Eco mindedness. Due to the delicateness of the systems and the personal exploration completed by many of the professional cave divers here, there is a great awareness of the fragility of these systems. YOu leave the caves the same way you found them. Become the best diver you can be so that you do not create damage. The cave divers who live in the area are always looking for better ways to streamline their equipment, safe guard the caves, teach other cave divers the need for preservation and will not let new cave divers enter if they are missing this philosophy. Self regulation is one of the best attributes of our cave divers and property owners. 5. Transportation. Cave systems open to the general public have easy access. Most caves are within a 30 to 45 minute drive and some just 10 minutes away. Entries are made easy by property owners and equipment is easy to rent. 6. Local Guides. The best way to access the caves is through a local certified cave diver who has dive center support and lots of years of experience. Why spend thousands of dollars to get here and then get frustrated with finding the best dives, the jumps and the best way to do a traverse. Local guides can make your cave vacation an easy and educational experience. It really is the only way to go. 7. Information. The cave diving community is open, honest and full of information, not only about cave diving but about what you can do in the area, the best things to do during your non diving time and they may even share a beer with you. We are a friendly bunch and love what we do so you will find that you get not only cave information but a whole lot more.